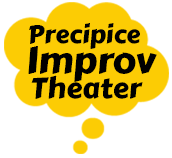 With no script, the extraordinary cast at Precipice performs full-length comic plays based only on audience suggestions. Our company of daring actors includes Bob Adler, Ric Andersen, Heather Benjamin, Laura Brown, Dan Mont, and Sheila Thibodeau. Learn more about Precipice's history today. Our hilarious shows have entertained audiences, being called "very entertaining and intelligently done" (Angela Rabitin). Gary Jacobs had been performing, teaching, producing, and directing short-form improvisational theater since 1980. He worked with John Daley and Bob Adler in two of his performing troupes in the late 1980’s. They even formed the core of several ongoing workshops Gary taught in long-form improv and improvised plays in the early 1990’s. But by 1995, Bob and John — veteran performers — had enough of improv theory and classroom work. They dared Gary to put his theories into practice in front of audiences. They challenged him to form an improv company dedicated to improvising full-length comic plays. And they agreed to help him. So, the three of them formed the core of Precipice Improv Theater in 1995. Undeterred by the challenge, Gary, Bob, and John found other fearless actors willing to take the artistic risks and formed Precipice. During their year-long rehearsal period before their first show in 1996, the Precipice actors noticed that very occasionally they succeeded. Sometimes, the play they improvised had a coherence, power, and humor of a good scripted, comic play. But it was more exciting because it was completely improvised. The actors clearly did not know what would happen next. And as a result, their characters and the plot achieved a freshness and spontaneity that scripted theater rarely, if ever, approached. During that rehearsal year, Gary, Bob, John, and the others started to develop the skills, principles, and practices to improvise good comic plays. Those first shows were rough around the edges. Some shows were much better than others. But most shows offered up at least one thrilling moment, a moment when the audience held its collective breath, completely caught up with the characters’ plight, worried about what would happen next, and realizing that truly, the characters and the performers had no idea either. These heightened moments shared by the audience and the improvisers made even the roughest shows special. What the Precipice ensemble discovered over the years is that their mission is so ambitious, and the play-improvising process is so complex, that their creative work never ends. Every show and every rehearsal bring fresh insights and teaches new lessons. Even after 22 years. So, the Precipice ensemble views their work as a permanent, ongoing creative exploration. Come join our grand experiment. Attend a show. Offer a suggestion if you like. All our plays develop from 2-6 suggestions we get from the audience at the start of the show. Nothing is prepared in advance. Not the characters. Not the plot. Not the setting. All of those elements are created afresh at every show, from audience suggestions. When a show goes particularly well, some audience members swear it must have been scripted. But our shows aren’t. Check us out and see for yourself!